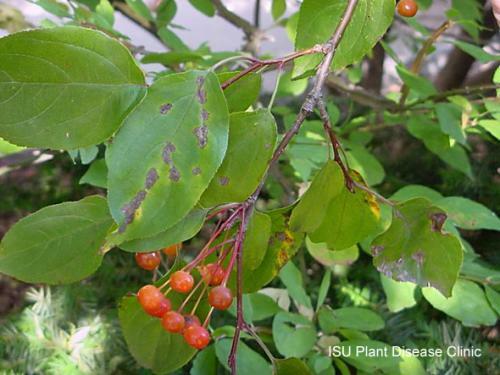 Apple scab is the most common disease of crabapple in Iowa, but can also be found on many varieties of apple and pear. 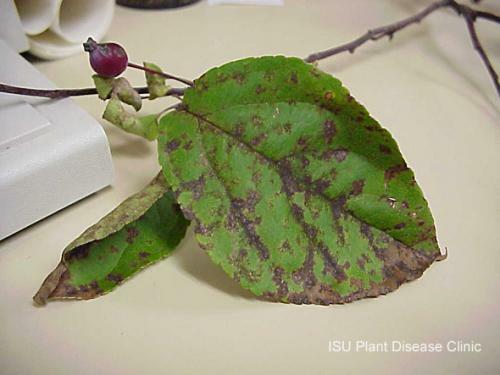 The causal fungus causes spots on leaves. In early stages, spots appear as small black or olive-green, velvety lesions with irregular margins. Later the spots become more distinct and may grow up to one-half inch in diameter. Infected leaves eventually turn yellow and fall prematurely. 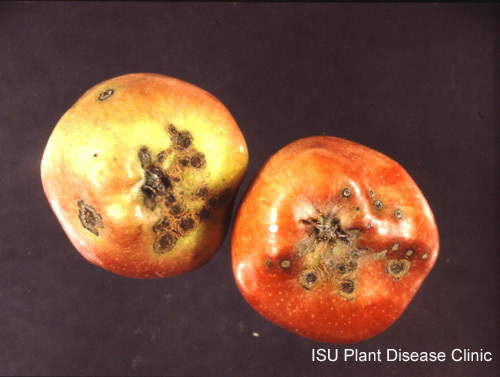 Infected fruit show distinct brown or black spots with margins that are often irregular. When severe, the skin splits open and irregularly shaped fruit results. Apple scab is caused by the fungus Venturia inaequalis (in apples and crabapples). This fungus survives the winter in infected leaves on the ground. In the spring, the fungus produces sexual spores (ascospores) that can travel by wind to infect newly-developing leaves. Once infection has begun, the fungus on the new leaves develops asexual spores (conidia) to reinfect the leaf and initiate infection of other nearby leaves. Cool, wet conditions in the spring favor apple scab, so the severity of disease seen in a given year can vary with the weather. Satiation means removing fallen leaves where the fungus that will overwinte. Removing and destroying fallen foliage (chopped and composted to proper temperatures or discarded as trash) in the autumn will dramatically reduce the number of this pathogen available to infect trees next year. The best line of defense against this disease would be to plant scab-resistant cultivars and pruning and training trees to allow good air circulation. There are fungicides labeled for the control of apple scab. Spray scab-susceptible with preventive treatment (before the symptoms are observed), may help reduce this disease, but scab is usually not a deadly disease. For more information on apple scab visit the APS article Apple scab.